How do you know if a client is actually ready for coaching, how can you tell in that very first trial session. For me, when I am working with a brand new client, I’m looking for a number of things but the number one thing that is always at the top of my mind when talking to someone new or someone I’ve been working with for say six sessions, is where is their sense of responsibility. 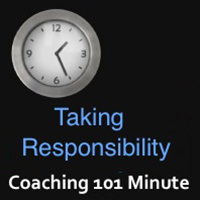 So, I think the biggest distinguisher for coaching versus other professions, like consulting or even mental health professions, is the topic of Responsibility. Now, often when someone comes to see a therapist or comes to a consultant, there’s a lot of responsibility on the shoulders of the client you’re looking for the person across from them to have the solution, to have the answer, Doctor, fix me, or what is the answer, what do you advise me to do. Where in coaching, it is all about the client being able to say, I want to do this, I may not know exactly how to do this. I have the ambition I have the drive. I have the desire to do this. I am taking responsibility myself right now. So, when talking to a brand new client on that first ten, twenty minutes or so, you can really tell where their mindset is. Are they able to say, Yes, I want to take this responsibility or am I looking for someone else to really carry the load for me so, it has to do with the words they’re are using, thrive versus committing, also just their perspective and their enthusiasm. It is the way they position their circumstance. You know, there is a fine line between responsibility and blame so I am not looking for someone who is blaming themselves, or blaming others. I am looking for a client who is able to say, you know what? I may have made choices up until now that have not been supportive to me, maybe I have missed opportunities, but today, starting right now, I want to take responsibility and take action. I want to, and I know I can, with the help of my coach. Q. How do I get started as a coach? Q. What is the earning potential for a certified coach? Q. How do you know when a client is ready for coaching?